Congratulations to Fenxiao (Jessica) Chen for Passing His Qualifying Exam on 01/22/19! 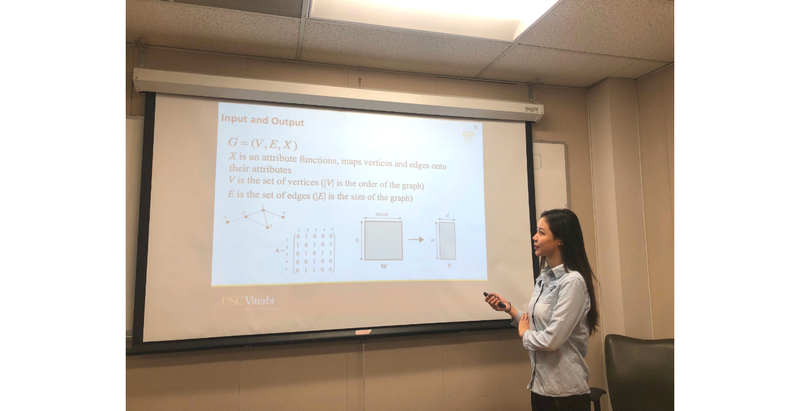 Her thesis proposal is titled with “GRAPH EMBEDDING WITH DEEP LEARNING TECHNIQUES”. Her Qualifying Exam Committee include: Jay Kuo (Chair), Sandy Sawchuk, Panos Georgiou, Viktor Prasanna and Xiong Ren (Outside Member). Graph representation learning is an important task nowadays due to the fact that most real-world data naturally comes in the form of graphs in many applications. Graph data often come in high-dimensional irregular form which makes them more difficult to analyze than the traditional low-dimensional data. Graph embedding has been widely used to convert graph data into a lower dimensional space while preserving the intrinsic properties of the original data. In this thesis proposal, we specifically study two graph embedding problems: 1) Developing effective and graph embedding techniques can provide researcher with deeper understanding of the collected data more efficiently; 2) Use the embedded information to conduct applications such as node classification and link prediction. To find an efficient way to learn and encode graph into a low dimensional embedding. We first present a novel Deepwalk-assisted Graph PCA (DGPCA) method is proposed for processing language network data represented by graphs. This method can generate a precise text representation for nodes (or vertices) in language networks. Unlike other existing work, our learned low dimensional vector representations add flexibility in exploring vertices neighborhood information while reducing noise contained in the original data. To demonstrate the effectiveness, we use DGPCA to classify vertices that contain text information in three language networks. Experimentally, DGPCA is shown to perform well on the language datasets in comparison to several state-of-the-art benchmarking methods. To solve the node prediction problem, we present A novel graph-to-tree conversion mechanism called the deep tree generation (DTG) algorithm is first proposed to predict text data represented by graphs. The DTG method can generate a richer and more accurate representation for nodes (or vertices) in graphs. It adds flexibility in exploring the vertex neighborhood information to better reflect the second order proximity and homophily equivalence in a graph. Then, a Deep-Tree Recursive Neural Network (DTRNN) method is presented and used to classify vertices that contains text data in graphs. To demonstrate the effectiveness of the DTRNN method, we apply it to three real-world graph datasets and show that the DTRNN method outperforms several stateof-the-art benchmarking methods.